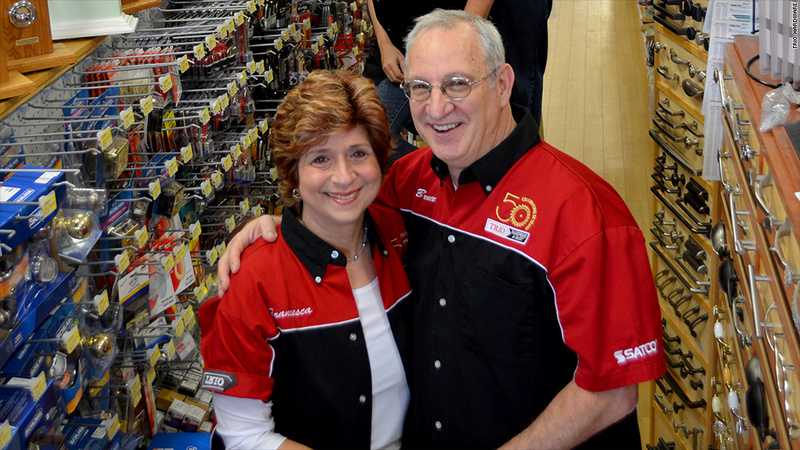 Francesca and Bruce Carlow say Trio Hardware would not have been alive for 50 years without their community's support. For 50 years, Trio Hardware has stayed rooted in its community, refusing to be driven out by big-box competitors. And on Thursday, the Plainview, N.Y., store was rewarded for its commitment with the title of America's favorite small business. For the third year in a row, advocacy group Independent We Stand has organized the Indie Awards, asking customers to nominate and vote for their favorite small businesses across the country. The contest, co-sponsored by Chrysler Group and STIHL Inc., drew over 32,000 votes for more than 250 businesses. Trio Hardware, a family-owned business on Long Island, received 2,024 votes, nearly 10% of the city's population, which put it in the top 10. A panel of judges then selected the winner. In addition to bragging rights, the company will receive prizes worth $15,000. "Our goal is to recognize a small business that has gone above and beyond with its customers and its community," said Bill Brunelle, executive director of Independent We Stand. "What stood out for us is how the community has rallied to keep Trio Hardware alive for so long." He's not exaggerating. In the '90s, residents staged a protest when the landlord tried to void the lease after a fire. More recently, there have been active campaigns to keep Home Depot (HD) and Lowe's (LOW) at bay. "It's still affecting us that those stores are nearby, but it could have killed us if they were right in our community," said Trio co-owner Bruce Carlow. The hardware store was started by Bruce's father in 1963. Its seven full-time employees -- two of whom recently became partners in the store -- have all worked there for at least 10 years. Bruce and his wife Francesca said their customers' loyalty also extends over decades. Elan Wurtzel has lived in Plainview for 26 years and has been shopping at Trio the entire time. "I loved going into the store back in the day when it was just a typical hardware store with dirty wooden floors," said Wurtzel. It's changed a bit since then, and the Carlows have worked hard to diversify their offerings "to keep up with the times and the competition," said Wurtzel. In addition to power tools and nails, the 3,500-square-foot store also sells art and sewing supplies, kitchen and garden products, cell phone accessories -- even "bra extenders," said Carlow. But for Wurtzel, the store's biggest appeal is how the Carlows and their employees treat customers. "Every employee knows what they're talking about," he said. "They never say no to you. If they don't have something, they'll order it for you." A number of respondents said the top-notch customer service was why Trio should receive the Indie Award. Carlow said Trio Hardware's employees know most of their customers by first name. "We like to give the kind of service that we want to receive ourselves," he said. Bruce said he and Francesca have thought about growing the business but haven't acted on it. "Could we possibly make more profits if we expand? Yes. But I think we'd lose our personality," said Bruce.